Master boxes at my hobby shop are going for 145.00 with the minis going for 50.00. With my discount I got about 20 bucks knocked off. Each mini pack promises an auto and each master includes 4-5 numbered parallels. In addition each mini has 6 packs with 5 cards. Being a new collector this year I enjoyed that all the cards are chrome refractors. 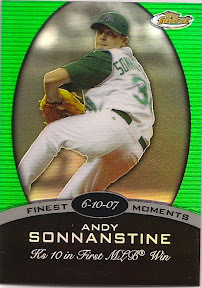 The base cards were refreshing to me all with nice photos of some of my favorite players. After thinking about it for a while I came to realize that a lot of the parallels look very very cheesy. The almost neon green, blue, and red colors just don't do it for me. Another problem I have is that the Topps Finest logo is gigantic and very distracting to the eye. I feel that they could have made it smaller to allow more room for a picture. The back of the card leaves me with a bad Moments and Milestone taste in my mouth. The back of the card features only last years and the players overall career stats. 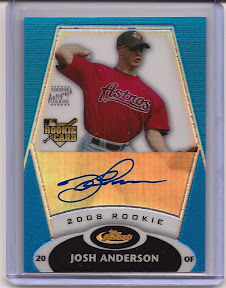 Being a Topps 08 collector I was very disappointed in the lack of stats. I also happened upon about 8 dupes including inserts. With how large the set is I didn't expect to pay 150.00 to have doubles in my first box. The last thing that upset me was the whole point of the box... the Autos. The autos I pulled will not give me enough return to want to buy another mini. It may sound selfish but selling off the cards I don't want gives me a nice fund to buy cards with. After all this complaining this is what I liked. The team favorites inserts are well done and appealing to the eye. 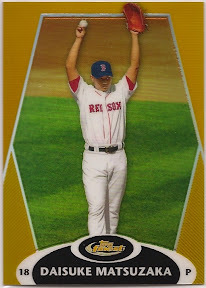 The base cards are good looking to me seeing that Ive never pulled any chrome cards. Along with the base cards I got my favorite player, Frank Thomas. 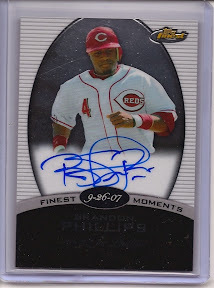 As far as autos and parallels go I pulled a Brandon Phillips auto that looks like he had a seizer while signing it and a gold numbered to 50 Dice K. To end it all I pulled a rookie redemption card #4. Glad I get to wait till November to get that one. Well thats all i got I hope you all enjoyed. The box may say "Topps Finest" but to me it seems like "Topps Overpriced". Wait a second whats this. . .
AAAAAHHHHH rookie auto blue parallel make it stop!! !